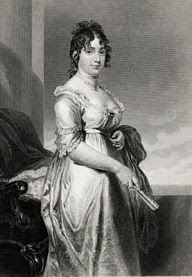 Dolley Madison introduced Angelica Singleton to President Martin Van Buren's son and then guided her through the intricacies of Washington entertaining and politics when she became the official White House hostess during Van Buren's term. Image: Angelica Van Buren's portrait was painted by Henry Inman, while White House hostess for her father-in-law, whose bust is seen in the background. Today it hangs in the White House above the fireplace mantle in what has become known as the Red Room. She was born Sarah Angelica Singleton on February 13, 1818 at Wedgefield, South Carolina, the daughter of prosperous cotton planters Richard and Rebecca Travis Coles Singleton. Angelica was raised at the family plantation Home Place in Sumter County, South Carolina. The Singletons believed strongly in the need to provide their daughters with an excellent education, beyond the traditional domestic arts. Jane Pierce (1806–1863), wife of 14th President Franklin Pierce, was First Lady of the United States from 1853 to 1857. She hated public life and society, but married a man whose passion was politics. She was refined, well-educated and religious, but her life is generally remembered as a series of tragedies. 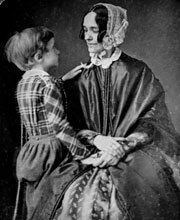 Jane Appleton was born on March 12, 1806 in Hampton, New Hampshire, the daughter of Elizabeth Means Appleton and Reverend Jesse Appleton, a Congregationalist minister. Jane was a petite, frail, shy and melancholy figure. After the death of her father, who had served as president of Bowdoin College in Brunswick, Maine, Jane moved into the mansion of her wealthy maternal grandparents in Amherst, New Hampshire at age 13. In the years leading up to America's second war with Britain, President James Madison's attempts to expand the country's armed forces had been unsuccessful. In 1811, Congress had voted to abolish Alexander Hamilton's Bank of the United States, making it nearly impossible for the government to raise money. Therefore, the United States began the War of 1812 with no Army to speak of and only a handful of frigates and a fleet of gunboats for a Navy. The spring of 1812 was a time of great anxiety for James and Dolley Madison. Although neither of them welcomed war, they both realized it was inevitable. At first, the war did not go well for the U.S. as American soldiers proved no match for their British counterparts. This became all the more evident in August 1814 when a British army landed in Maryland - too close to the American seat of government for comfort. Julia Tyler (1820–1889), the beautiful daughter of a prominent New York family, quickly became the darling of Washington society. Congressmen wooed her, but it was the widowed President John Tyler, thirty years her senior, who won her hand in marriage. Beginning at age 23 Julia Tyler served as First Lady of the United States from June 26, 1844, to March 4, 1845, captivating Americans with her beauty, gaiety, and love of public adulation. Julia Gardiner was born on July 29, 1820 on Gardiner's Island - a 3000-acre island off the eastern tip of Long Island, New York. She was the daughter of Juliana McLachlan Gardiner and David Gardiner, a prominent landowner and New York State Senator from 1824 to 1828. The family soon returned to their East Hampton home on Long Island when the Gardiner's Island farm proved unprofitable. Hannah Hoes Van Buren was the wife of U.S. President Martin Van Buren. She was the first president's wife to be born a U.S. citizen and not as a subject of the British crown. Because she died eighteen years before Van Buren became President (1837-1841), she is one of the most obscure of our First Ladies. Van Buren never remarried and was one of the few Presidents to be unmarried while in office. His new daughter-in-law Angelica Singleton Van Buren presided as the lady of the White House from 1839 until the end of his term. Hannah Hoes was born on March 8, 1783 in Kinderhook, New York to Johannes Dircksen Hoes and Maria Quakenbush Hoes who were of Dutch ancestry, and was raised on her family's farm. Hannah was taught in a local Kinderhook school by master Vrouw Lange. Dutch was her first language and she never lost her distinct Dutch accent. Louisa Johnson Adams was born in London, England - the only First Lady born outside of the United States. She met John Quincy Adams in 1794 when he was sent to England on a diplomatic mission, and they married shortly after his father, John Adams, became President. Their marriage was stormy and her mother-in-law, Abigail Adams, reportedly disapproved of Louisa. Anna Harrison, wife of the President William Henry Harrison, was First Lady of the United States during her husband's one-month term in 1841, though she never entered the White House. She also holds the distinction of being the only First Lady to be wife of one president and grandmother of another: twenty-third president, Benjamin Harrison. She was born Anna Tuthill Symmes on July 25, 1775 at the family estate Solitude near Morristown, New Jersey to John Cleves Symmes and Anna Tuthill Symmes, who died the following year. Anna's father was a Chief Justice of the New Jersey Supreme Court and later became a prominent landowner in southwestern Ohio. Elizabeth Kortright was born June 30, 1768, and was raised in New York City. Her mother died when Elizabeth was nine, and Hester Kortright, her paternal grandmother, raised the young girl. Hester had a reputation of being a strong and independent woman, who owned and managed her own vast real estate holdings in old Harlem. Elizabeth was considered one of the most beautiful women of her generation. James Monroe was born in Westmoreland County, Virginia, on April 28, 1758, on his parents' small plantation. He lost both parents by age 16 and inherited his father's estate. He enrolled in William and Mary College in 1774 but when the American Revolution began he left after two years. He enlisted as a lieutenant in the 3rd Virginia Regiment, and was seriously wounded at Trenton, and his heroism earned him the rank of major. Dolley Payne was born on May 20, 1768, in the Quaker settlement of New Garden in Guilford County, North Carolina. Her parents, John and Mary Coles Payne, had moved there from Virginia in 1765. Her mother, a Quaker, had married John Payne, a non-Quaker, in 1761. Three years later, John was admitted to the Quaker Monthly Meeting in Hanover County, Virginia, and Dolley Payne was raised in the Quaker faith. Martha Wayles was born at The Forest in Charles City County – near Williamsburg, Virginia – on October 30, 1748. Her parents were John Wayles and his first wife Martha (Patsy) Eppes, wealthy plantation owners. Martha's mother was the daughter of Francis Eppes of Bermuda Hundred, a huge Virginia plantation. Patsy died when her daughter Martha was only three weeks old. 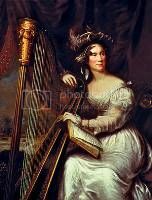 No record of her early years exist but in light of her father's wealth and prominence, Martha Wayles was likely educated at home by traveling tutors in literature, poetry, French, and Bible study; she likely received considerable training in music. Certainly a young woman of her region, era, and wealth would also be trained in sewing and medicinal preparations. Abigail Adams (1744-1818) was the wife of President John Adams, the mother of President John Quincy Adams, and the second First Lady of the United States. As the Second Continental Congress drafted and debated the Declaration of Independence, Abigail began to urge John in her letters that the creation of a new form of government was an opportunity to make the legal status of women equal to that of men. The text of those letters became some of the earliest known writings advocating women's rights. 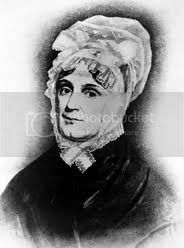 Abigail Smith was born on November 11, 1744, at Weymouth, Massachusetts to the Reverend William and Elizabeth Smith. On her mother's side, she was descended from the Quincys, a well-known political family in the Massachusetts Bay Colony, and a cousin of Dorothy Hancock. The Smith home was busy and active – visitors came often and relatives lived nearby. Abigail was a sickly child; throughout her youth, she suffered from one minor illness after another. Her parents feared that some disease or infection would cut her life short. She was fortunate to have a father who loved learning and gave her full access to his extensive library, and became one of the best-read women of her time. Abigail read widely in poetry, drama, history, theology and political theory. In this atmosphere she developed the values and moral fiber that would serve her as an adult.